There are few things more disastrous to a home than water damage. Water damage can lead to mold growth, wood rot and more. It poses a threat to not only the value of your property but also the well-being of you and your family. Winter can be one of the roughest months when it comes to water damage and your property, especially in the Midwest. In fact, the Chicagoland area alone has experienced an annual average of 37.1” of snowfall in the last 30 years. How do you best protect yourself from winter’s wrath? By being proactive in the care and upkeep of your home. The roof is the one areas of the home most prone to letting water in. Flashing damage, worn shingles and exposed seams can all allow moisture to seep inside the living space. Hidden underneath the surface, water damage can linger for years before being noticed. Locating and repairing roof damages is the only way to truly protect what’s inside. But when should you schedule your next inspection? The roof can be inspected at any time of the year, but can be especially useful when completed before winter arrives. The roof is one of the most difficult spots to access. A snow-covered surface can make inspections and repairs nearly impossible. It is also important that any small problems can be addressed before the ice and snow cause further damage. When it comes to quality roof inspections in the Chicagoland area look no further than Custom Installations. Our professional crew has experience working on all types of homes during every season of the year. We can thoroughly examine your roof and provide guidance on your best next steps. 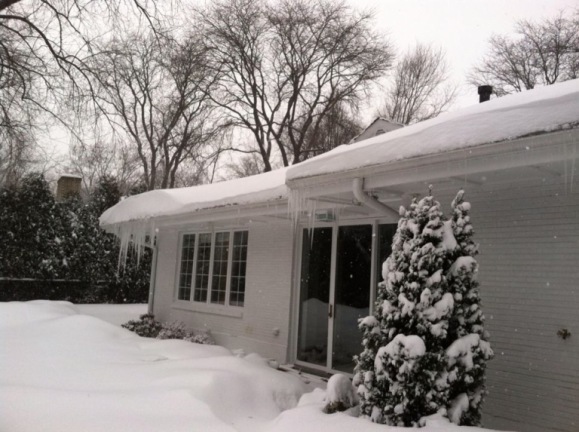 Don’t let winter slip by with a damaged roof. Contact us today to ensure your greatest asset is protected before the snowflakes start flying!